Justitia blindigbendita kaj tenanta pesilon kaj glavon. Jura Tribunalo de Viktorio, Honkongo. Justiculino, aŭ en latina Iustitia aŭ Justitia, aŭ ankaŭ Sinjorino Justico (latine Iustitia, nome romia diino de Justico, kiu estas ekvivalento de la greka diino Temiso) estas alegoria personigo de la morala forto en juraj sistemoj. Ŝiaj atributoj estas blindiga bendo, pesilo kaj glavo. Ŝi ofte aperas kiel partnero kun Prudentia, kiu tenas spegulon kaj serpenton. En klasika epoko temis pri religia koncepto; en nuntempo estas alegoria figuro tutmonde disvastigita sen ajna religia konotacio. ↑ Hamilton, Marci. 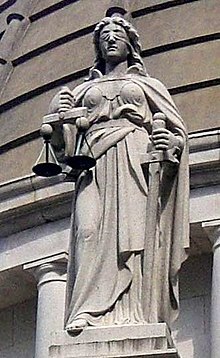 God vs. the Gavel, page 296 (Cambridge University Press 2005): "The symbol of the judicial system, seen in courtrooms throughout the United States, is blindfolded Lady Justice." ↑ Fabri, Marco. The challenge of change for judicial systems, paĝo 137 (IOS Press 2000): "the judicial system is intended to be apolitical, its symbol being that of a blindfolded Lady Justice holding balanced scales." Ĉi tiu paĝo estis lastafoje redaktita je 22:05, 17 maj. 2018.